The creation of Mas Saint Louis dates back to the late 1800’s. It was purchased by Jean-Louis Geniest in 1909. Jean-Louis Geniest was already well acquainted with the wine business at the time, as he owned a successful cooperage. It was Jean-Louis Geniest who built the original concrete vats. Some of those early concrete tanks are still in use today. The Geniest family still owns and manages the estate today. However, the estate previously sold their production to negociants. Those contracts expired with the 2011 vintage and they have not looked back since. Mas Saint Louis owns 30 hectares of vines planted in Chateauneuf du Pape. Most of their Southern Rhone terroir is made up of sand and rock strewn soils. The vineyard is planted to 80% old vine with varying amounts of Syrah, Mourvedre, Cinsault, Counoise, Picpoul, Bourboulenc and other assorted field blends planted in the vineyards. 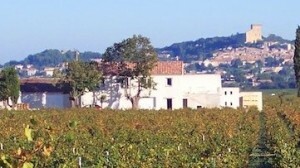 Mas Saint Louis is one of the few Chateauneuf du Pape vineyards planted in a single block of vines. This is almost unique as most vineyards in the appellation are spread out in different lieux-dits all over the region. Mas Saint Louis produces 3 red wines and 1 white Chateauneuf du Pape wine. Mas Saint Louis Chateauneuf du Pape Tradition is produced from 80% Grenache, 10% Mourvedre, 5% Syrah and 5% Cinsault. Although a small percentage of other grape varieties could also be in the blend from time to time. The terroir is rocks, stones and sand in the la Crousroute lieu-dit. The wine is vinified in old cement tanks and aged in a combination of foudres and tank for 12 months before bottling. Mas Saint Louis Les Arpents des Contrebandiers is produced from 75% Grenache, 10% Mourvedre, 10% Syrah and 5% Cinsault. The terroir is rocks, stones and sand in the la Crousroute vineyard. The wine is vinified cement vats and aged in both demi-muids and tank for 12 months. Mas Saint Louis Grande Reserve comes from a blend of 80% Grenache and 20% Mourvedre. The terroir is rocks, stones and sand in the la Crousroute lieu-dit. The wine is vinified in cement tanks. The aging takes place in demi-muids for an average of 12 months before the wine is bottled. Mas Saint Louis Blanc comes from a blend of 85% Grenache Blanc 10% Clairette and 5% Roussanne. The wine is vinified and aged in 80% stainless steel vats and 20% in French oak barrels. They are now also producing a Rose’. Mas Saint Louis can be enjoyed on the young side. Young vintages can be popped and poured, or decanted for about 1 hour, give or take. This allows the wine to soften and open its perfume. Older vintages might need very little decanting, just enough to remove the sediment. Mas Saint Louis is usually better with 1-3 years of bottle age. Of course that can vary slightly, depending on the vintage. In the best vintages the wine should be consumed within 2-8 years after the vintage. Mas Saint Louis is best served at 15.5 degrees Celsius, 60 degrees Fahrenheit. The cool, almost cellar temperature gives the wine more freshness and lift. Mas Saint Louis is best served with all types of classic meat dishes, veal, pork, beef, lamb, duck, game, roast chicken, roasted, braised, stewed dishes, sausage, grilled meats, barbecue and cassoulet. Mas Saint Louis is also good with Asian dishes, hearty fish courses like tuna, mushrooms, cheese, pasta, eggplant and tomatoes. The white wine of Mas Saint Louis is best served with a myriad of different seafood dishes, shellfish, crab, lobster, sushi, sashimi, chicken, pork and veal, as well as Asian cuisine. Floral notes are the first thing you find before moving to the salty, lively, fresh, red berry notes. Soft and fresh, with peppery, kirsch and minerals in the finish. You should be able to enjoy this on release. The wine was made with 75% Grenache and assorted, other allowable, grape varieties. Juicy black cherries, garrigue and red cherry notes are present from start to finish. Soft and polished, lush and sweet, the wine will drink well on release. The wine was made blending 80% Grenache with 20% Mourvedre. With a strong garrigue and olive note that rides on top of the red berries, the wine can use a few years in the cellar to help the fruit come to the forefront. The wine was made from blending 80% Grenache, 10% Syrah, 5% Cinsault and 5% Syrah. Garrigue roasted nuts, red cherries and herbs carry through from start to finish. Medium bodied, soft red fruits with a bright, herbal edge creates the finish. The wine was made blending 80% Grenache with 20% Mourvedre. Medium bodied, with bright red fruits, crisp cherries and a sweet and tart, strawberry finish is what you will find here. The wine was made with 75% Grenache and assorted, other allowable, grape varieties. Forward, medium bodied, sweet and tart red fruits with a definite herbal leaning. This crisp, spicy wine will show well early. The wine was made from blending 80% Grenache, 10% Syrah, 5% Cinsault and 5% Syrah. Smoky cherries and just picked herbs are easy to discern, The wine is medium bodied, forward, open and ready to drink, with a light, fresh, ripe, red berry note in the finish. Medium bodied, sweet and tart focused nose and palate are found here. This forward wine shows an olive and herb twist paired with the strawberries in the finish. Forward, easy drinking style of wine that delivers, great, uncomplicated, early drinking, kirsch and strawberry focused pleasure. The top wine from the domaine delivers a lush, ripe, sweet, round, peppery, meaty display of fruits that leave you with a good impression. It will be interesting to see how this wine performs in less difficult vintages. The wine was produced using a blend of 80% Grenache and 20% Mourvedre. Medium bodied, structured style of wine with a firm cherry and strawberry finish. Blending 80% Grenache, 10% Mourvedre, Syrah and 5% Cinsault created a medium bodied, fresh, soft, red cherry filled wine that's easy to drink on the young side. With a good depth of color, the spicy, kirsch filled wine is complicated by licorice, pepper and plum in the finish. Spicy, clean and fresh, this modern styled cuvee delivers a blast of juicy freshness in the finish. Medium bodied, sweet and spicy, this elegantly styled, Grenache dominated wine will drink best young. Sweet jammy, red fruit notes, with hints of fruit cake and spice lead to an open, elegant, forward wine. Red berries and citrus scents lead to an elegant, medium bodied, fresh, red berry wine. From a blend of 75% Grenache, 10% Mourvedre, 10% Syrah with assorted varietals making uo the remainder of the blend. The wine reached 14.5% alcohol.